Contrary to what some Loyal Readers may be thinking at this moment, this post is not about Life in the Boomer Lane’s experiences (or anyone’s else’s), canoodling with POTUS. Neither is LBL extending a magnanimous offer to POTUS, should he be tossed out of office and have n place to stay. It is, however, about something that many people would like to do to him, that is fun and won’t require the services of a good defense attorney. LBL is talking about a psychiatric assessment of our best-ever-most-smartest-and-best-spellor-and-best-user-of-Capital-Letters-and-best-everything-else-you-can-possibly-think-of President of the USofA. Some Readers might be apprehensive about attempting to analyze Trump without any credentials in this field. To allay your fears, LBL has good news: Justin Frank. Frank, a Harvard-educated psychoanalyst, with a list of accomplishments that is longer than Trump is tall, has done this for you. 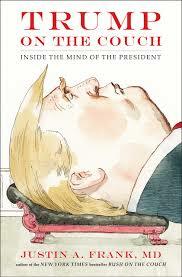 His book “Trump on the Couch:Inside the Mind of the President,” is a gem. LBL has just started to read it and she is hooked. It’s literate, deeply thought out, deeply researched, and, if you can set aside the giant black hole that has taken over your brain since election day, enjoyable in the face of terror. LBL was lucky enough to have attended a luncheon yesterday at the Democratic Women’s Club in Washington, DC, in which Frank was the speaker. He talked about his book and the research that went into it. He spoke about Trump’s family (a hotbed of dysfunction), Trump’s learning disabilities and inability to live up to his father’s expectations, his emotionally absent mother, and his stilted emotional development. Much of what Frank talked about, LBL already knew. But the way he drew all pieces together to explain the man was worth the price of admission. What emerged was a complex picture of one of the most powerful people in the world, who is incapable (not unwilling) of relating to that world. A question and answer period followed. People asked all the questions we ask ourselves: Why does his base stand firm in spite of anything? Why is the GOP complicit in all this? What can we do about any of this? And, most important, why hasn’t Trump given Nancy Pelosi a nickname? Believe it or not, Frank’s answer to this one was fascinating. LBL will not go into any further detain about the book. Instead, she will urge you to read it. Your reading will not change Trump in any way. It will not change the complicity of the GOP. It will not change the slavish adherence to him by his base. It will not end the government shutdown. But it will give you a direction in which to turn, one that doesn’t involve putting your sanity or your TV screen at risk. A snippet from the intro: Trump’s presidency caps a lifetime of dysfunction and disorder that is not likely to be healed while he is in office, just as Trump’s ascendency among voters gives expression to long-standing trends in the American electorate’s psyche that are not going to be easily addressed. However, if we can identify certain aspects of those disorders and trends that may have contributed to Trump and his voters fusing into a shared belief system, then we have a better chance of fostering the kind of honest cultural discussion that will be necessary in order to contain and begin to repair the damage that has already been done. Trump on the Couch, by Justin Frank. Well worth reading. Thank you for this! I’m on it. Let me know wht you think! This one sounds interesting. Aside from political beliefs I’ve noticed a lack of affection even for people he supposedly loves that I’ve never seen before. No warmth or tenderness with family or spouse. Even presidents that I have disagreed with have had that. It made them more human. I haven’t heard much about his upbringing. I’ve noticed that as well. He seems to see family members as adornments to him. And Ivanka is the prize adornment. Yes. Melania is under some contract which probably has an expiration date. Interesting. I might have to read it. If ou do, let me know what you think. Aside from the fact that he is trying to destroy America, he is quite a sad and pathetic figure. He has probably always had to “pay” for “love” in one way or another. I truly hope he gets connected with a really good mental health professional after he goes to prison. I agree that he is sad and pathetic, although his self-created image would never allow him to aknowledge that. Seeking help would be the last thing he’d have in mind, in prison or out. Thanks for this resource. I continue to ask all the questions you posed in your piece–hopefully this book will help me understand. To appear less like a hoarder, I have resorted to only purchasing books that can be vaporized with a click of my mouse or a swipe of my finger. It makes me feel as green as Kermit the frog, and equally as attractive. and also as an audiobook. trumponthecouch.com has links to all the versions. Thanks. I just ordered it from Amazon. Thanks for the input, Heather. Shelley, I might print and frame your first paragraph. This is going on my library list. Let me know what you thing. You are welcome. I love that some readers might get the book. I don’t understand the loyalty, but then there’s Jim Jones and Guyana in our past, so maybe it goes on all the time, just never reached the White House before now. I told people not to drink that Trump Kool-Aid. Alas, they didn’t listen. YEESH. I do think there are valid reasons for the loyalty. In this era of lightning speed technology and excessine education, a large percentage of the American population have felt neglected for many years.Trump acknowledged them used language they could actually understand And his wealth and celebrity status gave him credibility. He is a poor person’s image of a rich person. They were going to follow him to the Promised Land, and they keep marching, no matter that the road is going in the wrong direction. .
Have you also read Dr. Frank’s other books, Obama on the Couch and Bush on the Couch ? I know that as a person of the same age as the orange man, and having lived in New York State for 62 yrs – that it was easy to see that Trump was a ego maniac and a very insecure man who sought celebrity status at all costs. He interjected himself into any kind of public situation he could where he would be seen as important. I never understood people seeking interviews with Trump and asking his opinion on things he obviously was ignorant about and seemed so unintelligent about facts etc. Also listen to any of his Howard Stern interviews and you realize the man is a cartoon figure that Howard liked to have on, just because he could count on him for a ridiculous interview. But Trump never sees himself as the buffoon he is. He just thinks that he is a celebrity. Women were attracted to him for the “money”, and in his younger days he wasn’t an unattractive man with money. Marla Maples and the now first lady, married him for his money and not because they felt he was an intelligent, loving and caring man. I have family and friends who are huge orange man supporters. The things they have in common – is that they hated Obama, and Hillary as well. They are all NRA advocates,, they saw the orange one as someone different than the well known type of politician. And they also HATE that anyone thinks of them as “deplorable” or not intelligent etc. They can’t stand any critical assessment of their own thinking on the subject of the orange ones behavior. After yrs of indoctrination by Fox News hosts, blog stories that are passed around on social media as fact, and by yrs of Trumps tweets and public speeches – they are brainwashed and conditioned to stand by him no matter the facts or truth. They will refuse to say they are wrong about him and/or state that what he is saying is wrong or lies on a regular basis. And even if they do think he lies, they feel he is justified. They honestly feel that CNN and MSNBC are out to get him and they are the ones making up stuff and twisting the facts. The orange one is a Con Man who has conned people for years. People who are conned do not like to admit it. Especially ones who are representing his core base, if they admit they were taken in so easily, then they will need to be on the couch to understand it. They also feel that if they had seen Hillary win, that their natural instinctive hatred for her would grow. Fox News would have been as brutal on stories about her as CNN and MSNBC are about stories on the orange one. Dr Frank seems to enjoy writing his own opinions on the minds of former Presidents. But I don’t think he uncovers information that we already didn’t know about the current one or his dysfunctional family. And it really doesn’t matter, the orange one is the President appointed by the Electoral College, and unless the Democrats can find someone who can truly “win” in 2020, we are doomed for another 4 yrs. Trumps core base will rise up for sure. I also feel that if a woman wins the Democratic nomination that the USA still is not at the point of electing a woman. Having elected a “first” Black president, then a business man with zero political or public service experience, they aren’t willing to try another “first” ever, not yet anyway. And if Trump does win a 2nd term we will see another round of books written – giving us the various authors opinions on “WHY” it happened. If he doesn’t win, there will be a round of books telling us the stories of what really went on inside the orange man’s reign. There already are too many books trying to tell us – who and what this man is about and what he has done to our country to date. I have no plans to add to Dr Franks bank account or any other author who wants to tell us about the orange man and what makes him tick. He is one of the most transparent personalities we have had as a President. It doesn’t take a psychoanalyst to figure him out. Just roll tape. I wonder when Dr Frank will do a Pence on the couch book 😉 – so that others can understand how that man can stand next to the orange one and support him – or why Pence is such a sad/weak figure and has so many odd beliefs. Thanks for taking the time to express all of your thoughts. It would take me way too long to address all of the points you have raised. But we agree that this man is not worthy of the office of president, nor of any position in which he has the ability to influence people.